I like how the reward for solving the puzzle is the same volume which is cited as the primary reference for the puzzle. So if you used it, then you evidently don't need one, and if you didn't use it, then you also evidently don't need one, in a different sense. Maybe it could be a gift. 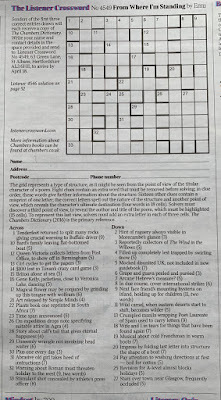 All flippancy aside, though, I am in such awe of people who can construct such intricate puzzles as these – I was at a pub quiz last week that tied together several species of puzzling and had interlocking rounds, and as far as I can tell it's just magic. Keep on keeping on, Emu Wizard! I normally consider The Listener beyond my powers, but I'm going to have a go at this one purely out of love for John. 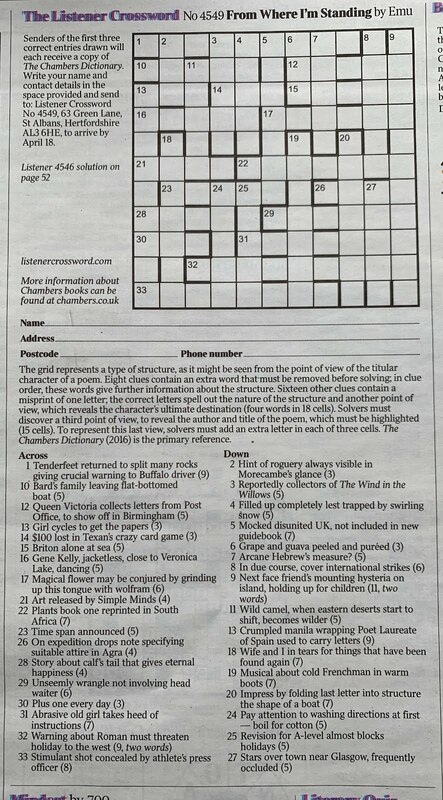 @Tealin, I once won the Guardian's Saturday Prize Crossword and, perhaps even more ironically, the prize was Hugh Stephenson's Secrets of the Setters: How to Solve the Guardian Crossword. Hugh Stephenson is the Guardian's crossword editor, so he was probably happy to shift another unit. Oh, yes, and a copy of the Guardian's Style Guide. You confound the received wisdom that nobody likes a smart arse. Even as a crossword fan, this makes me feel like plankton amongst dolphins, but I still love you to bits. Congratulations, John. Remember, if you ever want one published in the Telegraph then drop me a line! I realise that this is the wrong post to make this comment so apologies. That nice Mr Naismith mentioned in his latest Clue e mail your JFSP tour later this year. However there were no London / near London dates mentioned. Are there more dates to come - Richmond theatre ?